This is a very simple storage or toy chest free woodworking plan. The plan does not include diagrams, but the description of how to build this free project is very good. The beginner might want to start with finger joints instead of the dove tails, but it's up to you. I'm sure that the tradition of the hope chest, where young unmarried women would collect clothing or household linens in anticipation of marriage, doesn't still linger on. If it does, you'll need this free woodworking plan from ToolGirl.com. This is a beginner woodworking project that has very detailed step by step instructions, materials list, tool list, cut list, and more. This professionally done plan from Popular woodworking is for a hanging wall cabinet. They have detailed plans that can be downloaded in PDF format and a materials list is included. This box is the latest addition to the tourney gear we usually bring to events. 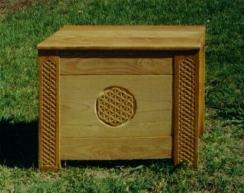 It's not a strict reproduction of any particular box, but rather a combination of two styles. This is a beautiful woodworking project that you can build with this free plan from Popular Woodworking. There isn't a ton of directions on how to build this project, but they do give you a PDF file showing all of the dimensions within a detailed materials list and good diagrams.